UPDATED: Thu., Feb. 1, 2018, 10:06 p.m.
SAN DIEGO – Thirteen and counting. Gonzaga continued to roll undefeated through the West Coast Conference, defeating San Diego 63-44 on Thursday for its 13th consecutive victory, 11 in WCC play. Second-place BYU (13-9, 8-3 WCC) gets the next shot at Gonzaga (18-4, 11-0), hosting the Bulldogs at 1 p.m. Saturday. BYU defeated Loyola Marymount 62-52. Reigning WCC player of the week Jill Barta led Gonzaga with 13 points. Chandler Smith scored 12 and grabbed a team-high seven rebounds. 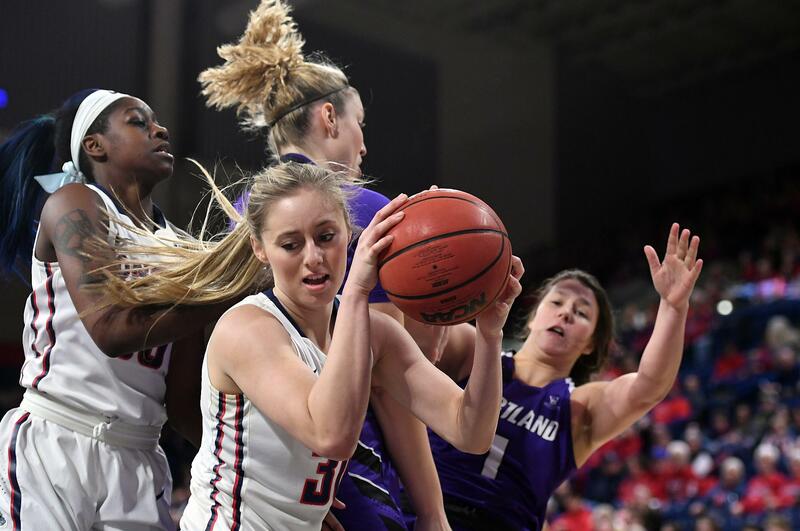 Laura Stockton scored nine and Jessie Loera seven, with each of them grabbing three of Gonzaga’s 11 steals. “We had a lot of people contribute on the offensive end. Everyone who played scored. We are playing some good basketball right now and I’m happy for the team,” Gonzaga coach Lisa Fortier said. The loss was the third in a row for San Diego (12-10, 5-6). The Toreros’ leading scorer was Aubrey Ward-El with 14 points. Their top rebounder was Myah Pace with seven. Gonzaga has taken great pride in its defense of late and had forced 20 or more turnovers in three of its past four games. San Diego committed 18. The Bulldogs led 15-14 after the first quarter, then pushed their lead to 11 at halftime (35-24) and 23 entering the fourth quarter (54-31). USD opened the fourth quarter with a run that cut Gonzaga’s lead to 56-40 with 5 minutes left. Smith ended that run with a 3-pointer. Gonzaga’s last points came on a layup by Katie Campbell with 2:20 remaining, but San Diego managed just two points itself in those closing minutes. Published: Feb. 1, 2018, 8:38 p.m. Updated: Feb. 1, 2018, 10:06 p.m.